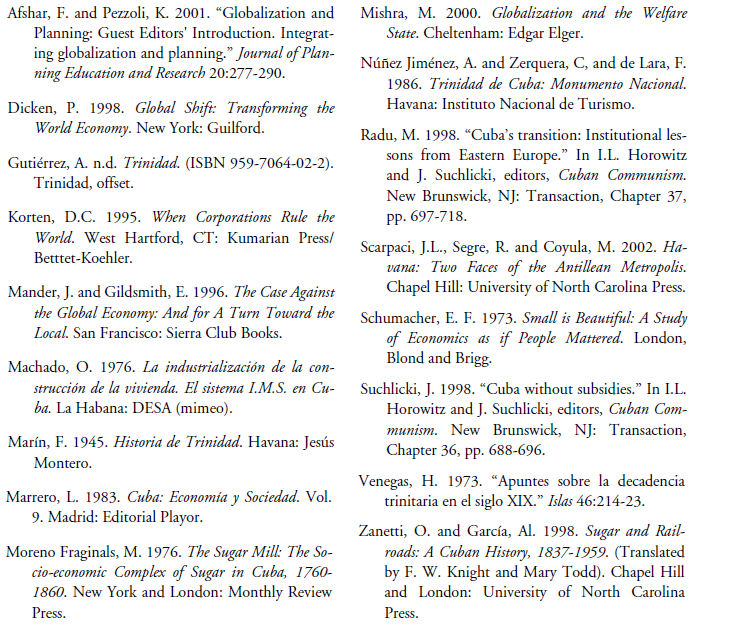 Globalization studies are the 500-pound gorilla in contemporary social science research. While the meaning of “globalization” is the subject of many debates, there is no doubt that the popularity of the topic is widespread. Once a term confined to policy analysts and scholars, the close of the 20th century quickly secured a place for “globalization” in the world’s languages, practically becoming a household word thanks to a dizzying array of “gee whiz!” technologies. One metric of its usage in academic circles is its citation in the Library of Congress Card Catalog. In 1987, there were no entries for “globalization” as a keyword in the library’s card catalog. In 1994, Waters (2000) found 34 entries; in August 2000, I found 884. In August 2001 there were 1,384 entries, a 57% increase in eleven months (excluding the British spelling “globalisation” n= 213). By July 2002, the number of entries had dipped to 1,273, suggesting more nuanced classifications of books at the library. While the use of the term is widespread, I contend that case-study research is one way to anchor these broad processes in micro-geographies. If globalization is a slippery concept that has come to mean everything, then it also conveys very little meaning. I use it mainly to refer to a shrinking of time and space through the rise of information technologies. We can theorize the economic, political, and cultural dimensions of globalization to make our review of world problems more precise (Lerner and Bohli 2000). As information and commodities are exchanged at a quickening pace, the abilities of the nation-state and its regulatory agencies diminish. That means nations slowly lose control over the flows of information, capital, and technology that pass through their boundaries. Some argue that these “new spaces of globalization” represent a victory of post-Fordist capitalism (Dicken 1999) because new types of investment are no longer based on the traditional components of economic development that included natural resources and cheap labor. Because labor unions and the conventional blocs of voters are made increasingly powerless in a globalized world, transnational capital can more easily circumvent the traditional coalitions who looked to the state for protection and support (Mishra 2000; Afshar and Pezzoli 2001; Korten 1995; Mander and Goldsmith 1996). Because the party leadership directly controls all institutions, all-important decisions, from management to personnel to planning and production targets, are dependent upon the central policymaking apparatus, the Politburo. Hence, the ability to respond promptly to any challenge or unexpected development is severe ly hindered, and individual responsibility by institutional leaders is inhibited. Attempts at institutional reform–whether workers self management … or decentralization of planning … failed because they did not (and, by the logic of communist system, could not) escape from the party’s ultimate control. In recent years, new wealth has come to Trinidad in the form of tourism development. The Ministry of Tourism has been promoting Trinidad as a “tourist pole” along with Santiago (east), the keys and archipelagoes (north central), and Havana-Varadero (northwest). Specifically, Cuban tourism authorities seek investors to develop the Ancón peninsula, 9 kilometers south of Trinidad. However, the Ministry’s five-year plan is at odds with the goals of the City Restoration Office. My research question is, then, whether a cultural heritage site with international reputation, UNESCO World Heritage Status, and articulate and passionate leadership by architects at the local level, could possibly be compromised by development of tourism at the national level. This dilemma encapsulates the tensions inherent in “glocal” studies. Who jeopardizes Trinidad’s colonial charm in the name of hard currency earnings? On the one hand, the Cuban leadership needs hard currency to sustain its social provision. On the other, local officials in Trinidad believe an unfettered international tourism market bound for its town and beaches could spoil an international heritage site. I argue that while inter-governmental collaboration among various local, regional, and national agencies is always rife with conflict, the Trinidad case study strikingly shows a top-down approach to economic development plans. In this paper, I draw on the relationship between tourism and heritage planning in Trinidad and the adjacent Sugar Mill Valley (Valle de los Ingenios) to make this point. The paper begins with a brief historical overview, to which we turn in the next section. Trinidad (pop. 42,000) is a colonial gem on the south-central coast of Cuba (Figure 1). Characterized by geographic isolation, it is tucked away at the foot of the scenic Escambray Mountains. This historic villa was the fourth of seven initial settlements forged in 1514 by Diego de Velázquez, but it took Trinidad three centuries to reflect the opulence of sugar wealth. Trinidad sits on the southern slopes of the Sierra de Trinidad, about 8 kilometers north of its Caribbean port, Casilda. Chronicles of the site date back to 1494 when a seaman in Columbus’ crew noted hunters and gatherers in the region. They described a landscape with “fruits and bread and water and cotton, and rabbits and doves of the most different species, unknown in our lands, and [the indigenous people] sang joyfully believing that people had come from heaven” (Gutiérrez n.d, 3). Settled in 1514 by Diego Velázquez, Trinidad lost the attention of the conquistadores when Hernán Córtez, who had stopped there briefly and later, controlled the Central Valley of Mexico. Spain’s interest shifted to the mineral- rich mainland at Trinidad’s expense. During the 16th and 17th centuries, the settlement remained distant and hard to reach, which led to a contraband economy. Out of the oversight of Santiago de Cuba to the east, and Havana to the west, English, French, and Dutch pirates and corsairs took advantage of Spain’s frequent wars in Europe to make Trinidad one of the primary smuggling areas. Trinidad’s economy benefited from events in Spain and the Caribbean. Reforms enacted during the reign of Carlos III (1759-1788) broke the privileges and monopolies that Havana enjoyed. Trinidad benefited from these Bourbon reforms and expanded trade, especially with other Caribbean islands and the South American port of Cartagena. In the nearby island of Saint Dominique (Haiti), the 1792 slave revolt led sugar planters to resettle in Trinidad. The adjacent Sugar Mill Valley (Valle de los Ingenios) had fertile soils and came to house more than 50 sugar mills by the early nineteenth century. 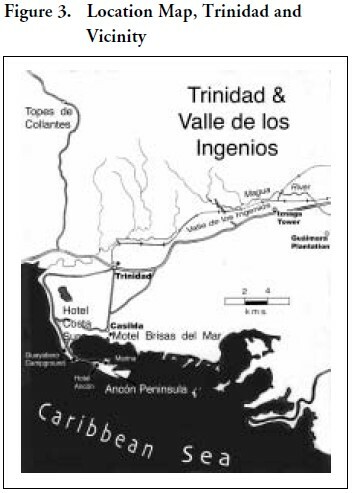 By 1825, Trinidad was producing 10% of the island’s total sugar output, and all of it came out of one valley (Venegas 1973). Trinidad and its vicinity became one of the world’s leading sugar producers. Several restored palaces that are now museums show the opulence of the era (Núñez Jiménez, Zerquera, and de Lara, 1986). Landed aristocrats usually spent the sugar-harvest season in country palaces, and the remainder of the year in Trinidad. The family names of the elite from that era—Brunet, Becquer, Cantero, Iznaga, and Borello—constructed elaborate residences in Trinidad that are national landmarks. The 1827 census showed 29,000 residents, 12,000 of whom lived in the urban core, with the remainder scattered throughout the countryside in sugar mills and small hamlets (Gutiérrez 1997, 29). 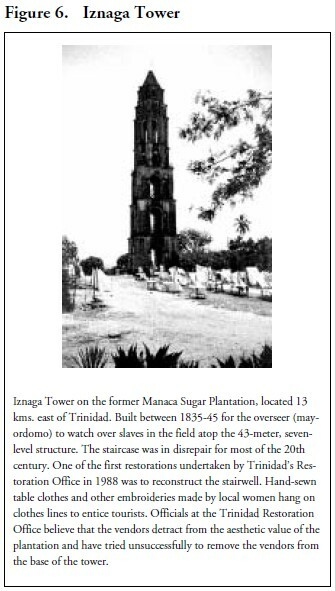 By the mid-1800s, however, Trinidad’s traditional slave-based sugar production method could not keep pace with the newly introduced mills. 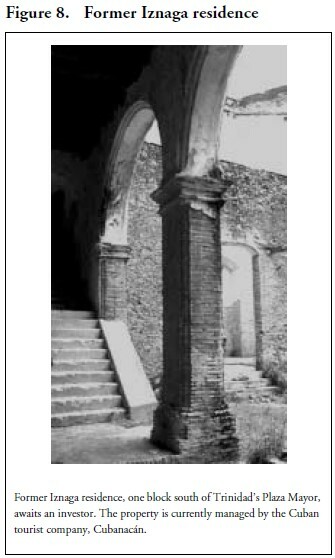 The traditional trapiche on which the Trinidad sugar economy was based, consisting of oxen-driven grinders for crushing the cane, could not compete with modern mills (Marrero 1983). Since slavery was not abolished officially until 1878, the landed aristocracy was loath to abandon the system and modernize sugar production. Other parts of Cuba and Louisiana competed with the sugar production in Trinidad. Increased European sugar production also undercut the world price of the commodity. In the 1820s and 1830s, investment opportunities attracted local capitalists to support railroad construction between Villa Clara and Cienfuegos, and between Puerto Principe and Nuevitas. Meanwhile, Trinidad experienced stop-and-go railroad construction and an eleborate rail network to transport sugar cane was never fully established. Instead, plantation owners used their slaves to float cane down rivers for processing at the trapiches. When the rivers filled in from siltation, logistics in getting cane to the trapiches were complicated. Moreover, Cienfuegos, founded late (1804) in Cuban history, opened its new deepwater seaport and that siphoned off traffic from Casilda, Trinidad’s port. For all these reasons, the town and region had fallen into a deep recession by 1860. While other sugargrowing regions of Cuba—especially parts of Matanzas and Havana provinces—were connected by rail lines to sugar mills for processing, and ports for export, Trinidad remained isolated and the region stagnated. Independence wars in the late 19th centuries reduced cattle production in the valleys and coffee cultivation in the foothills and mountains around Trinidad. When American investors entered the region after the war of 1898, they bought large tracts of land cheaply and replaced some 48 smaller ingenios with a single, modern sugar mill (central) (Marín 1945). 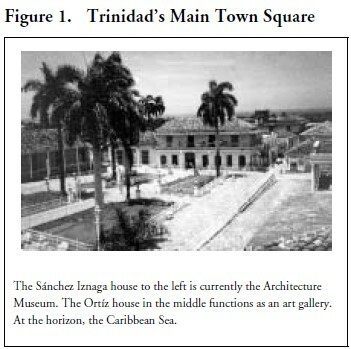 Economic recession and geographic isolation, then, left important sections of the historic core of Trinidad in place. It was not until 1919 that a rail line made its way to Trinidad and connected the town with the national network. A paved road to Sancti Spiritus to the east, was completed in 1950 and two years later, another road was paved to Cienfuegos, to the west. All these factors of history, transportation, and technology kept Trinidad isolated and, in turn, helped ensure the antiquity of its built environment. In the 1980s, Trinidad’s municipal government began to capitalize on that architectural resource for heritage tourism. In 1988, UNESCO declared it a World Heritage Site. Outside tourism in the historic core, the rest of the city and region has various industries such as sugar refineries, sawmills, dairies, fisheries, cigar, cattle, and cigarette factories. A small airport brings in several flights daily from the “tourist poles” of Santiago de Cuba, Camagüey, Varadero, and Havana. The first hotel with modern tourist facilities in Trinidad was erected in 1957. Hotel Las Cuevas sits on a hillside just above the colonial core beyond the historic limits. Within the historic district, there are no hotels, and the larger facilities are a 20-minute drive to Ancón Beach, on the Caribbean Sea. Fortunately, no modern structures disrupt the colonial skyline of Trinidad’s centro histórico. However, in 2002, more than 50 legal bed-and-breakfast facilities operated, placing serious burdens on the city’s water and waste system. In the section that follows, I discuss the Ministry of Tourism’s 1998 plan to add 5,000 more hotel beds to the Ancón peninsula on the Caribbean, and the implications of such plan for the World Heritage site of Trinidad and Valle de los Ingenios. Forty years ago, CIA director Richard Bissel argued that Playa Ancón should be the site of the ill-fated Bay of Pigs Invasion, and not Girón beach located to the west. Unlike the Bay of Pigs (surrounded by thick mangroves and layers of coral reefs), Ancón Beach is flat and very accessible. Today, a new invasion is expected. 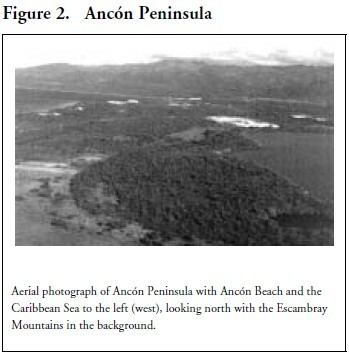 The Tourism Ministry seeks to add 5,000 hotel rooms to the only part of the greater Trinidad area that can handle such growth: the Ancón peninsula (Figure 2). Since the announcement in 2000, only one 300-bed facility was built, and that was done by a Cuban company, not a joint-venture. These construction figures are very different from the 5,000 units the ministry desires. By mid-2002, only three hotels (Hotel Ancón, 279 rooms; Hotel Costa Sur, 131 rooms; Trinidad al Mar, 420 rooms) occupied the peninsula. The primary attraction is the four-kilometer beach with sugary white sand, Playa Ancón, on the Caribbean Sea (Figure 2). Hotel Ancón, located on the beach, represents the hundreds of pre-fabricated designs created during the first two decades of the Revolution. Schools, factories, office buildings, and hotels adopted a series of pre-fabricated models that were used in France, Yugoslavia, Scandinavia, and Canada (Machado 1976). Prefabrication in Cuba was economical and symbolic because it: became reference points for the Revolution’s modernization efforts…[and] spread to the most unlikely and remote corners…The enduring nature of Soviet power had been reaffirmed by victory over barbarian Nazi forces. Soviet planning sought to show new features and rights of the unfolding socialist society (Scarpaci et al 2002, 212). To some degree, this philosophy was evident in the use of prefabrication in Cuba as well. Although prefabrication exists on the beach and in the post-colonial quarters of the city, it is not found in the historic district. Imagine dozens of larger buses parked outside the historic center, with their air conditioning units running. The vibrations will shake the streets and buildings, while thousands of tourists flood the historic center. They’re going to need restaurants and bathrooms. The pressure on the old city will be incredible. Three major attributes may encourage tourism that, in turn, will attract investment. Foremost is the colonial charm of old Trinidad. The design of elite homes reflects a blend of Spanish and French styles, especially evident in the traditional ceramic roof tiles. As noted above, the French came when sugar-cane planters fled the 1792 slave revolt in nearby Haiti (Zanetti and García 1998). With the Louisiana Purchase in 1803, more French growers resettled in this corner of the West Indies. 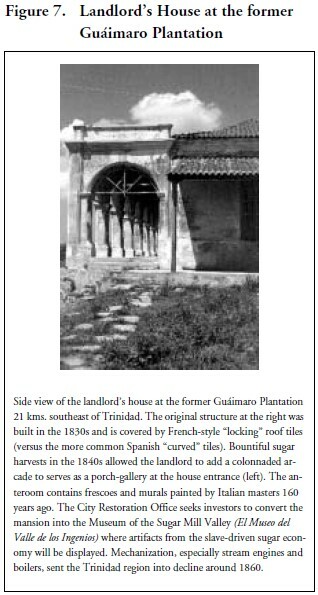 Economic prowess grew into what historian Moreno Fraginals (1976) calls Cuba’s “sugar aristocracy” or “sugar-ocracy.” The result is a rich blend of Spanish, French and Creole architecture, graced by cobbled streets made out of ship ballast or rocks from nearby streams and quarries. 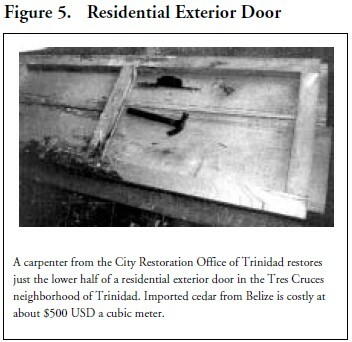 The City Restoration Office is the primary entity handling historic preservation in Trinidad. Formed in 1988, the office has restored dozens of mansions that have been turned into museums and cultural centers. Since 1997, the office has been renovating a large residential quarter in the eastern part of the city called Tres Cruces (Figure 5). Second, Trinidad is one of the few beach areas (in a region that geologically speaking has a “submerged coastline”) on Cuba’s south coast, in contrast to the tourist preference for the aquamarine waters and beaches that abound off the north coast. With a paved airport runway that dates back to the 1950s, the town airport receives small commercial flights several times daily from Havana, Varadero, Camagüey, and Santiago de Cuba. Lastly, Trinidad offers tourists an attractive relative location. It serves as a departure point to explore the Escambray Mountains and the Topes de Collantes health-resort complex that sits at an elevation of about 830 meters, just one hour away. The town is also adjacent to the Sugar Mill Valley (El Valle de los Ingenios), which once held dozens of mills from the late 18th and early 19th centuries (Figure 6). The valley is the only natural landscape (not a town or city) designated a UNESCO World Heritage Site in Cuba (Old Havana, and, of course, Trinidad, are the other two). Architects, planners, geographers, and engineers make up the 24 professionals of the Trinidad Restoration Office. 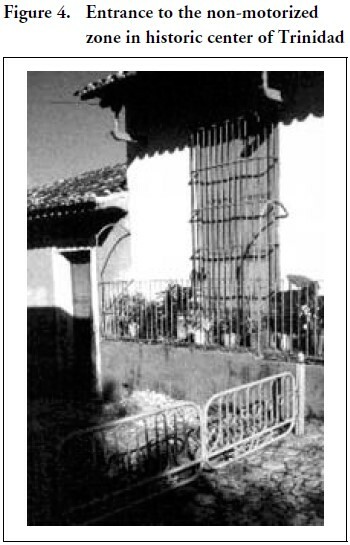 They direct the renovation of several sugar plantations in the valley and hope to open a sugar museum in one of the former homes (Figure 7). Old slave quarters and tool sheds will be restored or reconverted for bathrooms and small restaurants. Investors are sought for reconverting specific properties in the valley both to relieve some of the tourism pressures in Trinidad, and to revive old buildings that still contain frescoes painted by Italian and French painters in the 1830s. While this financing scheme for heritage preservation is innovative and serves as a window to Cuba’s new political economy, some obstacles remain. Many companies that operate in either national currency (pesos) or hard currency (dollars) do not always pay. Some firms are so far in arrears with the Restoration Office, that the small group of architects has had to take the “debtors” to court and sue them for payment. Litigation drains the limited resources of the Restoration Office. Thus, not unlike market economies where cooperation is not always forthcoming, intra-governmental coordination is not always easy, even in the centrally planned economy of Cuba. Trindad, Habana Vieja, and Santiago de Cuba serve as models for historic preservation, heritage tourism, and sustainable development in several important ways. • First, they target specific revenues out of a larger pool of funds for upgrading the built environment of their neighborhoods. A cash-strapped state does not have to divert funds from health, education, or related public welfare sectors for this purpose. Rather, funds come from state entities that generate their own revenues. Thus, the cost sharing is minimum (2%) and widely distributed throughout the businesses that operate in the city of 42,000. • Second, dollar-paying facilities earn their revenues from tourists, not Cubans. In that sense, one can make (and implicitly this ethos is echoed among the Trinidad community) the argument that tourists should be (indirectly) responsible for maintaining heritage sites, not the Cuban people who have seen their standard of living decline. • Finally, the financing scheme is sustainable in that the revenues are proportional to the volume of tourists passing through. In some way, then, the Restoration Office budget will “rise and fall” with the ebb and flow of tourism. Holding constant for the moment the possible consequences of the 5,000 beds to be added on the beach, this 2% tax will allow for the constant and steady upgrading of the UNESCO site so that costly intervention is not necessary later this century. The post-Soviet era sent shock waves throughout Eastern European nations and Cuba (Suchlicki 1998). Forced to compete without preferential prices for sugar exports, Cuba entered the global market. Since the early 1990s, it has drawn on a traditional comparative advantage, tourism, as a source of hard currency. In particular, it promotes heritage tourism as a venue to complement the traditional sun-and-surf outlets inherent in Caribbean tourism. This paper has attempted to show the ways in which a local heritage tourism setting immerses itself in the broader patterns of globalization, but with the socialist government as the intermediary force. In contemporary Cuba, some economic development decisions made at the national level override local planning goals. In Trinidad, the City Restoration Office was notified of the 5000-bed goal after the Tourism Ministry made its decision. The differences of opinion between local and national decision-makers underscore the locals’ concern with authentic heritage preservation and the latter’s search for hard currency. A final determination on hotel bids, jointventure agreements, and building construction was to be made by late 2000, but by mid-2002, there was still no word on these proposals. E.F. Schumacher’s celebrated work, Small is Beautiful, made a passionate plea for development projects that were locally defined, bottom-up, and small in scale. He railed against the mammoth development projects of the day: those undertaken by the Alliance for Progress in Latin America as well as a spate of World Bank-funded works in Africa, Asia, and Latin America. Tourism planning and heritage preservation in Trinidad, Cuba embody a number of those tenets. Nevertheless, this paper has shown that firms operating in centrally planned economies are not necessarily more altruistic and cooperative than their counterparts in market economies. Opportunity comes knocking at local heritage tourism offices in ways that are serendipitous, if not tragic. Trinidad’s Restoration Office currently benefits from a budget that exists in good measure because of the demise of the former USSR, and the dissolution of Cuba’s traditional trading partners in Eastern Europe. No one could have anticipated the global ramifications of the events in 1989 for Trinidad, which has brought both challenges and opportunities in terms of how “glocal” processes manifest themselves in the town’s built environment. Perhaps the real mettle of this new financing scheme will surface when the intragovernmental differences about beachfront development are resolved, and the residential quarters of Tres Cruces neighborhood are fully restored so that preservationists can practice their craft without policy mandates from afar.